If you’re approaching retirement, you might be contemplating whether you should relocate to another city or even another state. As you compare home prices and cost of living expenses, don’t forget to include another important factor: taxes. In fact, you might want to move to one of the most tax-friendly states for retirees. A new GOBankingRates study factored in several variables, including state taxes on Social Security benefits, sales taxes, income taxes and property taxes. It scored each factor comparatively and then weighted them to determine which states had a combination of factors that would be especially tax-friendly for retirees. The results are illuminating. When you consider that many people move in retirement — whether it’s buying a vacation home, moving closer to family or just seeking out a warmer climate — knowing the difference in tax rates from state to state can be essential to planning a happy retirement. If you’re living in Minnesota but planning on buying a condo in Nevada to escape the winters, for example, the choice of which location to make your official residence could mean a difference of thousands of dollars a year on your tax bill. One major takeaway from the study is that states with taxes on Social Security benefits ranked very low. Of the states that have taxes on Social Security income, 12 of them ranked in the bottom 15 least tax-friendly states. Income taxes, likewise, made a big difference. 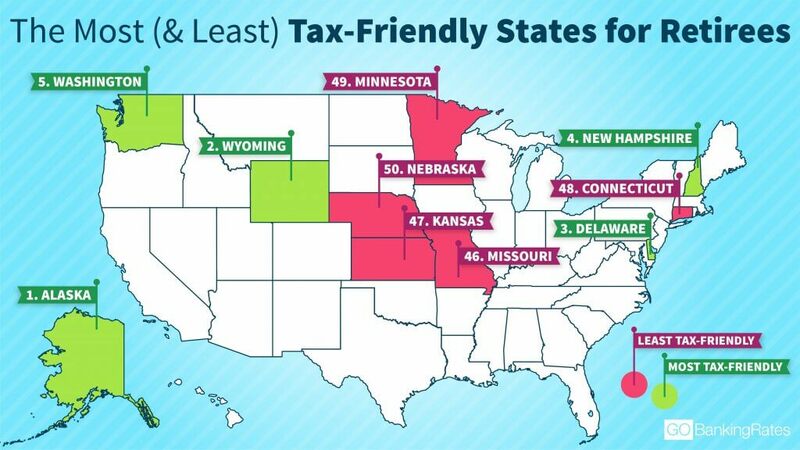 Of the top 10 most tax-friendly states, only two have any state income taxes. Texas has no state income tax and fell outside the top 10, coming in at No. 20 due to its relatively high sales tax rate (8.19 percent) and property tax rate (1.62 percent). Keep reading to see what a comfortable retirement will cost you in every state.